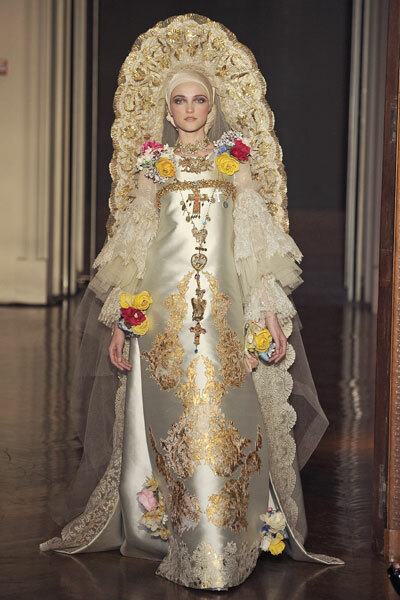 It was an haute coutureshow full of emotion, a collection produced on a shoestring and only made possible by the collective will and donated time and skills of the seamstresses, embroiderers, jewelers, milliners and shoemakers loyal to Christian Lacroix. Only the models were paid, €50 each according to French law, but they ended up in tears too. Lacroix didn’t cry, he said he wants to continue, maybe in a different way, with a smaller atelier. Het just cares about the women who do the job for him. 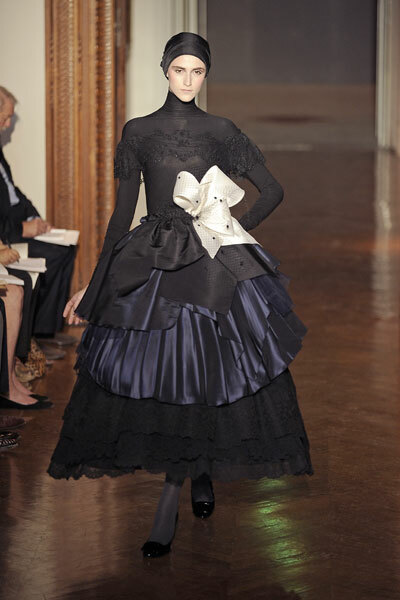 The collection was sober and restraint, only in black and midnight blue and concentrated on shape and wearability. In al its purity it showed Lacroix’ craftsmanship. As the designer came out to lead he bride in the finale, the whole audience stood up to honour him. Bravo!